Illumination is paramount. 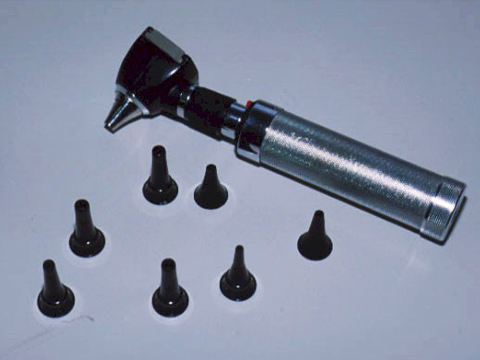 Run down batteries and dim lights will make you job even more difficult and will sometimes alter your perception of the image you see.If you are handed an otoscope with worn out batteries, insist that they are replaced. Most modern hand held otoscope have a very bright bulb that is more than adequate for the job.se the biggest earpiece that you can fit in to the ear canal. Small earpieces may be easy to use but the amount of visual information you get is very limited. Hold the otoscope at the end nearer the eyepiece, this way movement of your hand and arm is not translated into as much movement of the tip of the otoscope in the ear canal which may cause discomfort. Holding the otoscope at the end like this can lead to increased discomfort if you move your hand suddenly. This diagram shows some of the features you can expect looking at a normal drum. There is no substitute for looking at as many drums as you can to give you an idea of what is normal and what is abnormal. Look in your fellow students ears to start with. The drum is slightly convex being most medial at the end of the malleus handle or umbo. Abnormalities of shape are important, the drum may be bulging our, suggesting increased middle ear pressure, such as in acute otitis media, or retracted inwards with negative middle ear pressure, which is one of the otoscopic findings in glue ear. Mild retraction may be difficult to identify. The margin of the drum (annulus may become more pronounced as in this image. As the drum retracts so does the handle of the malleus and it may appear to be shortened on otoscopy. The lateral process will also become much more prominent than normal. As the drum becomes increasingly retracted, it drapes over the ossicular chain, and the incus and stapes head may be outlined. Eventually, nearly all the middle ear space may be lost and the drum comes into contact with the medial wall of the middle ear (this is known as atelectasis). Bulging ear drums are usually fairly obvious and a result of increased middle ear pressure. 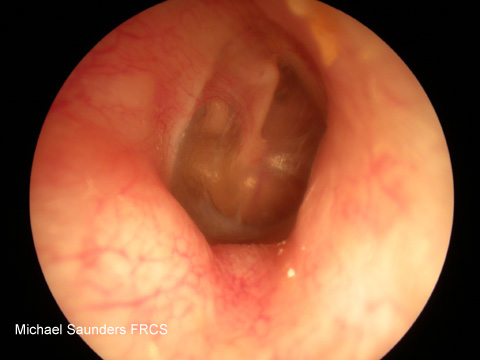 The most likely cause of this is acute otitis media when the drum will not only bulge outwards, but is usually very red because of hyperaemia and infection. 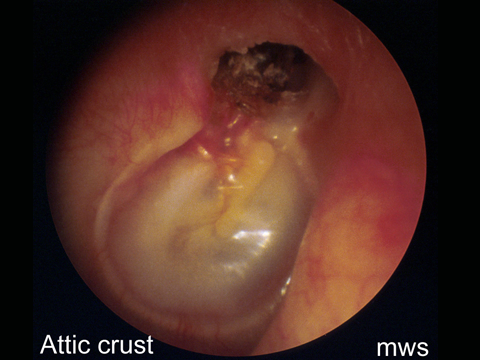 Unfortunately I have found good images of acute otitis media hard to come by because the patients are usually very young and not over disposed to sit still to have pictures taken! This is a grommet (ventilating tube) in the correct position in the drum. The hole in the middle should be clear of debris. Note a small dried crust above the grommet which is unimportant and may be a small clot remaining from surgery. Just because you can see a grommet in the ear does not mean it is working. This one is clearly extruding and on it’s way out up the canal. Note the drum visible in the distance. This grommet is in the correct position but is covered in infective granulation and blocked up. This will not be doing any good and may be responsible for a chronic discharge. Note also the extensive tympanosclerosis on the drum. This is a T-tube which is a permanent sort of grommet designed not to extrude on it’s own. These are not commonly used as they lead to a greater risk of perforation after removal, but in selected cases are preferable to repeated insertions of standard pattern tubes. The ear canal tends to have a slight anterior bulge and it is usually easier to see the posterior part of the drum than the anterior part. The canal may be partly straightened by pulling the pinna backwards and upwards during examination. In infants pull the pinna more horizontally backwards as the shape of the ear canal is different. In addition, the angle of the drum may appear different in small children, with the top of the drum appearing more lateral than the inferior part. Note the appearance of the ear canal including it’s diameter and the presence of wax. It is usual to see some wax in almost every ear. Larger deposits may obscure the view of the drum, but this does not necessarily imply that the wax is causing deafness. The canal needs to be almost completely obstructed to case hearing loss. Wax is not normally present in the inner third of the ear canal. It’s presence there may indicate inappropriate use of cotton buds to clean the ears of it may be a dried up crust, overlying more significant pathology such as a perforation or cholesteatoma. In otitis externa, an infective / inflammatory condition, the canal may be so swollen that a view into the ear is impossible. In swimmers, divers and surfers, chronic cold water exposure can lead to the growth of bony swellings in the canal known asexostoses. These are generally asymptomatic when small, but when larger can interfere with the drainage of wax and predispose to infections such as otitis externa. These black dots (spores) are the appearance of fungal infection (aspergillus niger) with other fungi the spores may be white or yellow. 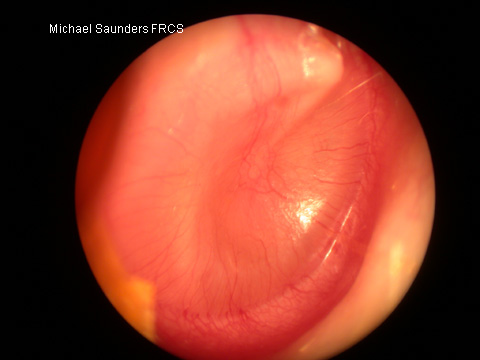 This is chronic otitis externa. Although the canal wall is not swollen, the skin is excoriated and red. The drum is essentially normal. Foreign body in the canal of a child (wax crayon) note the drum visible distal to the foreign body. The normal drum is quite translucent and does not really appear to be any colour except perhaps grey. The colour of the drum can be changed by thickening of the drum itself, injection of blood vessels, or the presence of something behind it such as glue, pus or blood. Compare this drum with the normal one. It is opaque and pale. There is slight injection of blood vessels. This is one appearance of glue ear. Glue ear may make the drum yellow or even darker than normal. Note also how retracted this drum is and how prominent the lateral process of the malleus appears. Blood in the middle ear will give the ear a blue or brown colour, this is called ahaemotympanum. Bubbles. You may see bubbles behind the drum. This represents a resolving middle ear effusion, as air gradually re-enters the middle ear. In this image, the bubbles appear much larger. White Patches. White patches actually on the drum or within the drum itself are usually tympanosclerosis, which is deposition of calcium into the drum itself in response to trauma or infection. This is not normally of any consequence unless it is severe, which can lead to a mild conductive hearing loss. 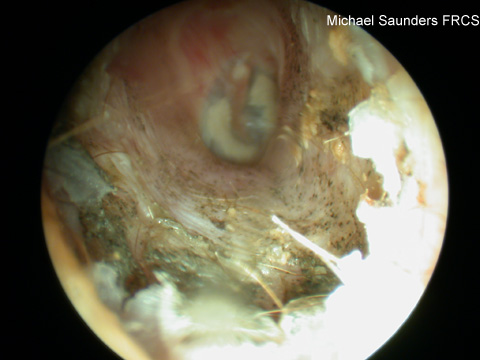 If the white patch is behind the drum, this may represent cholesteatoma (keratin in the middle ear). This normally needs to be treated surgically. Red/Blue Lesions on the Drum. 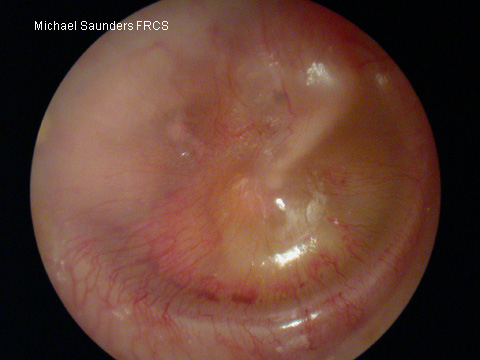 A diffusely red drum usually represents otitis media. More localised areas of discoloration can represent infection or vascular abnormalities behind the drum.This small red lesion at the tip of the malleus handle is a vascular lesion called a glomus tumour. This might cause pulsatile tinnitus, but is rare. This needs surgical treatment. This red bulge in the canal is another glomus tumour (glomus jugulare). this is the tip of a much larger lesion involving the temporal bone. 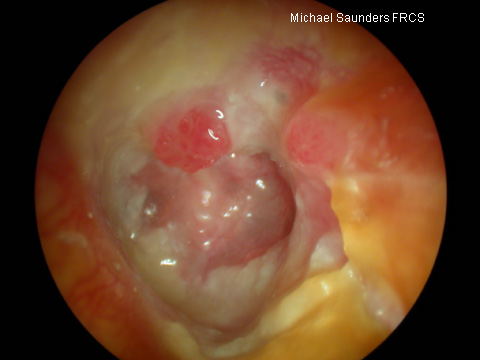 This red raised lesion on the posterior aspect of the drum is likely to be a granulation. Granulations are a localised infective process and may be a sign of more serious underlying disease such as cholesteatoma. You need to be able to distinguish between safe and unsafe perorations. 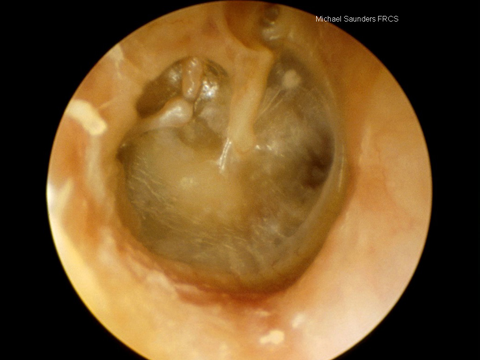 A safe perforation is exactly what it sounds like: a hole in the tympanic membrane. The main risk of safe perforations are that they may allow infection to enter the middle ear but there are rarely more serious sequelae. Safe perforation of the anterior part of the drum. A common cause of perforations in this position is a persistent defect after the extrusion of a grommet. Inferior perforation. This is more likely to be as a result of chronic middle ear infection. Posterior perforation. Although posterior perforations may represent more serious disease such as cholesteatoma, this is well described and dry. It is possible to make out the posterior margin of this defect. Traumatic perforations (eg barotrauma) are often posterior and liner, like a tear rather than a round hole. 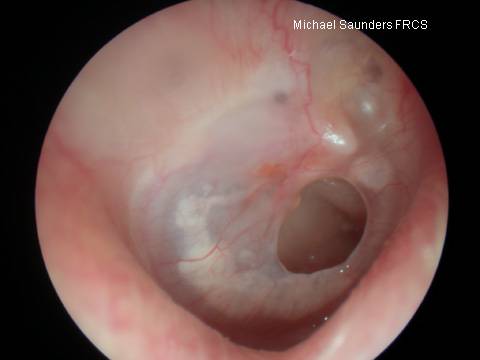 Unsafe perforations are not in fact holes in the drum, they represent a retraction of the tympanic membrane. Essentially a part of the drum becomes sucked inwards and may gradually enlarge. When the retraction becomes extensive, keratinous debris builds up in the retraction and may become infected. This is essentially how acquired cholesteatoma develops.Cholesteatoma is a dangerous lesion because it is capable of eroding through bone and may cause serious and even life threatening complications – hence the use of the term unsafe.Any defect or apparent perforation in the attic must be considered unsafe and should be referred for ENT assessment. This crust in the attic represents a large underlying cholesteatoma sac. A posterior perforation where the posterior margin of the drum is also potentially unsafe. In this image, not only is the posterior margin of the drum not visible (you can imagine a retraction disappearing behind the posterior margin to the right of the picture) but there are granulations and crusting in the attic. Granulations like this are often associated with underlying disease, particularly if they arise in the attic.